Time flies, today is 30th June 2014. June is going to end soon and this indicates that the June's Little Thumbs Up event is gong to end soon, for anyone who had yet to link up your post, kindly link up your post here before the deadline. I would like to take this opportunity to thank everyone for your support in this event, without you, this event wouldn't be so successful. We have more than 300 butter posts link up with this month's Little Thumbs Up event, I am so happy about it! The most popular links includes the magic custard cake, Japanese condense milk bread and Wu Pao-Chun champion toast. Next, in July, we have Jasline (Foodie Baker) to host the Little Thumbs Up event, her theme is potato, don't forget to join us for this event! 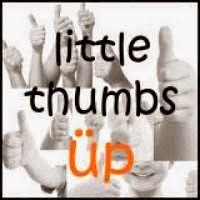 With the ending of June's Little Thumbs Up event, I would like to temporarily stop blogging for a while because I have few important datelines to be met. I hope I can get them done as soon as possible and back to blogging soon. Thank you for your support in the Little Thumbs Up event, I am so glad that through this event, I get to know more bloggers. Hi Jozelyn, you're welcome. I would like to thank you for hosting the LTU event. With this event, we are expose to so many lovely recipes, broadens our food knowledge and most of all getting to know so many bloggers and visitors to our blog. Their comments are great inspirations for us to continue sharing reliable recipes that we have tried and enjoyed. Hope to see you soon. Hi, Kimmy, thank you for your continuous support in the LTU event! Hi Jozelyn, a big THANK YOU to you for hosting the June's LTU event. Like what Kimmy had shared, I too had benefitted from sharings by so many bloggers as well as inspirations and encouragements received. Thumbs Up ^-^! You are welcome, Karen, thanks for your continuous support in the LTU event! 真心谢谢你每次到我家留言。让还在努力学习的我很感动。 Thumbs Up to your effort too! Thanks, Joyce, looking forward to see you soon! Thanks Jozelyn for being such a great hostess!!! Thanks Zoe and Mui Mui for giving me a chance to host this event!